Most families want to know about establishing breastfeeding, and the best way to describe the early days is “early and often”. As soon as your baby is born, s/he should be dried and placed skin-to-skin with you (that means no bra or other coverings between you and your new baby), as soon as you are both medically stable. If you have a C-section your significant other/ husband can do skin-to-skin until you are ready to begin, this can be as early as when you are moved from the operating room table and into a bed. If it is a vaginal birth Skin to Skin should be done immediately upon delivery. You have been carrying this baby for the last 9 months, and you should be the first one to hold your child. There are many benefits to beginning skin-to-skin right after delivery. Baby stabilizes quickly, there is less crying and when s/he show the first feeding cues s/he are near their food source and will be able to wiggle their way toward the breast if they are placed with their chest on your chest and not their back to you. No newborn can turn over to find the breast but they are able to do a primitive crawl known as the breast crawl. (Check out YouTube for videos of this!) Most babies are ready to do the first feeding somewhere between 30 minutes to 2 hours after delivery. Her/his first sign of readiness to feed is s/he will start to lick and look for some food, and will start a slow progression toward the breast. If s/he doesn’t seem interested, don’t distress, massage your breast and manually express a small amount of colostrum place it on your finger and offer if to the infant. Baby weights and measurements can wait until after the first feeding is accomplished. Infant eye prophylaxis can be done while doing skin-to-skin, or even on the breast, once s/he have had time to explore and find the breast. The nurse can also do vital signs, check blood sugars (if needed), and do Apgar scores while s/he is Skin to Skin with you. If you are concerned about the vernix or amniotic fluid being on you, don’t worry, most is removed with the drying of the baby, and a diaper can be placed on baby. In the early days babies need 8-12 feedings in a 24 hour period. This does not mean every 2-3 hours but rather it means feeding your baby when s/he are showing feeding cues; licking, smacking, trying to get hands to mouth, turning their heads from side to side, making little sounds. Crying is one of the last signs of being hungry, and if they have gotten to that point you may have to calm them with skin-to-skin and soothing sounds before they will feed. Sometimes babies cry because s/he may need a diaper change, a burping, or need to be picked up. Crying is not always an indication of hunger. If s/he is not showing any of the other signs of hunger, think about what else they might need. 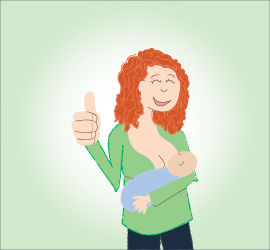 Sometimes your baby may take one breast in a feeding, other times s/he may take both. Remember! Babies don’t read a clock…they go by what their body is telling them. Some babies will do what are called “clusters” or “bunch feedings,” which are several feedings close together and then they may sleep for a while. Often these may be the same times of day or night that they were the busiest inside of you. Remember, if your child moved every night, that is their normal awake time, so they are not automatically going to start sleeping longer periods at night. For most parents the second night is the hardest, so remember to sleep when the baby sleeps. It does not take two people to take care of the baby. Ask dad, grandmother, or friend to watch the baby for a while so you can rest. Make sure they know feeding cues so they can wake you to feed the baby. They can also do skin-to-skin with the baby to help calm them and feel secure. As your baby grows, s/he will get more efficient with their feeds so they may be shorter than in the newborn period. When babies go through growth spurts, s/he will want to feed a lot for a few days and then they will go back to what was their normal feeding pattern. So don’t think that when baby wants to nurse all the time that your milk is drying up, as long as they are growing and good output they are fine. If you are ever worried about your milk supply or anything else, talk to your lactation consultant or call the TN breastfeeding hotline at 1-855-4BF-MOMS. Often families wonder how they are going to fit breastfeeding into their lives, but the best way is to get information before baby is born and talk to your employer before you go out on maternity leave. Get all the relevant information together before your meeting with the boss or HR dept. Look at www.nolamom.org for talking points with your employer. How long are you going to be able to take off for maternity leave? The longer you can stay home with your baby the less pumping you will have to do at work. Is there a way to work part of your time at home the first few months? Can you job share with someone else? Educate your employer! The more breastmilk your baby gets the less likely you will have to stay home with a sick child. If you are out due to your child’s illness, they either have to pay someone else to do your job, plus your sick time, or your work is backed up because you are out. Do you work in a smoke free environment where smokers have to go outside to smoke? If so, you will probably spend less time pumping then the smoker spends outside smoking. Do you have a clean and private place at work to pump, that is not a bathroom? Federal law states that any work place, that has more than 50 employees, must provide a private place to pump and time to pump (which does not have to be paid time). Can you either feed your baby or pump at the beginning of your work day so that you can go longer before you have to express your milk? This will help reduce the number of times you may have to pump during the workday (and may make you more comfortable). Can you go where your child is on your lunch break and lunch together (i.e. both of you eat during this time)? If you have a scheduled lunch break, visiting your baby for a nursing session may ease the separation for both of you. Where will you store your expressed milk while at work? Is there a breakroom refrigerator, or will you need to take a cooler with you? Many breastpumps include a chilled compartment with ice packs for this purpose. Many insurance companies will pay for a high quality double electric breastpump, so check with them. The Affordable Healthcare Act actually ensures that your insurance company will cover the cost of a pump for you! Make sure to contact your insurance company to find out their requirements for you to be reimbursed. Also check to see if you can use your flexible spending account money on breastfeeding supplies, and if you have a high enough medical deduction of more than 7.5% of adjusted gross income on your itemized taxes you can deduct breastfeeding costs. WIC is another fantastic option in obtaining a breast pump. What you express at work should be what infant takes the next day while you are at work. If you leave milk when you pick up your child at the end of the day, that is one less thing you have to worry about getting the next morning when are rushing to get out the door for work. According to the CDC, breastmilk is not a biohazard, so it should be treated like any other food taken to the day care. Check with your child care provider about labeling. Be sure to at least include the child’s name and date that is expressed. Make sure that the child care provider is aware that breastmilk will separate into layers and this does not mean that it is bad. Just gently swirl to mix after warming milk in warm water (nothing that goes into your child’s mouth should ever be heated in the microwave). Breastmilk can have different colors or smells depending on what is in your diet. If you eat a lot of yellow/orange foods or have a lot of fat in your milk it will have more of a golden hue to milk. If you have a lot of dark green vegetables there may be a green hue to milk. If you ate a meal heavy in garlic it may have more of a garlic smell. Notify your childcare provider that breastfeed babies usually don’t take as much expressed milk at a time as a formula feed baby of the same age; often baby will only take 3-5 ounces per feeding at 6 months. Explain her/his signs of hunger and what s/he does to indicate that they are done, so they are less likely to overfeed or have breastmilk wasted (you will quickly view your milk as “liquid gold,” as it represents both your baby’s food source as well as your own time and effort). For breastfeeding laws please look at www.breastfeedinglaw.com and www.sustainablemothering.com.